'The Tragedy of Tragedies', or 'The Life and Death of Tom Thumb the Great' by Henry Fielding wowed its audience at its first production in 1731 with its combination of satire and burlesque. Although much of the satire has been lost, the burlesque is still very much accessible and works to great comic effect - "Oh!, Monstrous, dreadful, terrible oh, oh!" (Act 3 scene III). By rights, Henry Fielding’s celebrated short farce about his even shorter hero should be incomprehensible to us today. First performed in 1730 and revised the following year, it’s a burlesque on the conventions of the heroical-tragical drama then in vogue at Drury Lane. Even the most dedicated theatregoer now is unlikely to have heard of, let alone seen a play by, the objects of Fielding’s derision – Nathaniel Lee, James Thomson and the like. So why does Tom Thumb remain so irresistibly funny when so much of the specificity of its humour is lost on us? I’m not quite sure, but ‘Monty Python’ and ‘Blackadder’ certainly owe a debt to Fielding’s comic vision. Set at the court of a very unheroic King Arthur, The Tragedy of Tragedies, or the Life and Death of Tom Thumb the Great – to give the work its full title – is very silly indeed. Characters have names like Noodle, Doodle and Foodle and speak in fantastically rhymed couplets and absurd similes. Plot-wise, love complications multiply – basically, everyone fancies a piece of the diminutive hero despite his being denounced as ‘fitter for your pocket than your bed’ – while rebellion gathers force, climaxing in a most bloody, bombastic and bathetic finale. Oh, and death by cow. Ben Bazell’s delightfully exuberant production certainly captures the spirit of Fielding’s timeless nonsense, with some fine contributions from the cast – most notably from Mansel David, who as Lord Grizzle delivers a performance of vintage pop-eyed hamming. Tom Thumb was the one of Henry Fielding’s satires poking fun at the landed gentry. Written in 1730, the play presents the toffs as promiscuous drunkards, mocking their flowery words. fielding’s plays and novels met with great success but his burlesques touched a nerve in the government and it is said 1730s theatre censorship laws were aimed largely at preventing performances of his works. This histrionic production with Lucy May Constantini as the pint-sized warrior and giant slayer stays true to the spirit of Fielding, ridiculing acts of pseudo-heroism and leadership. The stage is awash with fancy dress box costumes and a towering giantess (Tim Killick) resplendent in leopard print ambles around the set by King Arthur (Ben Bazell). Cupid’s misdirected arrows cause havoc, while the zealous hero fights for the hand of Princess Huncamunca (Anna Delchev). The smitten princess performs a beautifully sung slapstick duet with her maid (Susan Cazenove) but the giantess, Glumdulca, and the princess are not alone in their lust for the smug hero – through a haze of liquor Queen Dollollolla (Patti Holloway) shares their desires. Notable amongst this frenzied action is an understated performance by Morris Perry as Merlin. The cast make an excellent job of overacting in a manner encouraged by Fielding. Noodle and Doodle burst on to the stage to announce the arrival of the little boy hero in the hilarious Tom Thumb the Great. Writer Scriblerus Secundus, also known as the 18th-century playwright and novelist, Henry Fielding, has made an appearance already. The sound crew soon get it wrong as well, providing a noisy storm when the characters say the sun should be wearing its birthday suit. This all within the opening minutes of a truly funny and dramatic production at the Rosemary Branch theatre in Islington. A distinguished cast from Off The Page! creates a series of larger-than-life characters, including the giant in drag, Glumdalca. 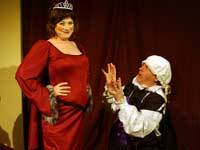 Queen Dollallolla, played with flustered charm by Patti Holloway, presides with Ben Bazell’s King Arthur at the riotous royal court. Lucy-May Constantini is a true panto principal boy as Tom Thumb and seeks the hand of Anna Delchev’s lively, petulant and tuneful Princess Huncamunca. The enthusiastic courtiers, Noodle and Doodle, are played by Simon Frewin and and James McAuley with plenty of verve and slapstick talent. Memorable characters, including Mansel David’s lecherous Lord Grizzle, provide some flies in the ointment and it all goes horribly wrong in the end. Fielding, author of the classic novels, Tom Jones and Joseph Andrews, wrote Tom Thumb in 1730 to send up the pompous heroic drama of the day. He joined the satirical attacks on the Walpole government which led to the Licensing Act of 1734 and limited the number of ’legitimate’ London theatres to two. Fielding was a member of a group of famous Tory satirists, including Pope and Swift – but the play pokes fun at both the ‘uppermost’ and ‘undermost’ political parties. Under Bazell’s direction, this ‘tragedy of tragedies’ comes to life again in an enjoyable, panto-style show. The Life and Death of Tom Thumb the Great is Off The Page!’s third production for the Rosemary Branch and really does cut the mustard.